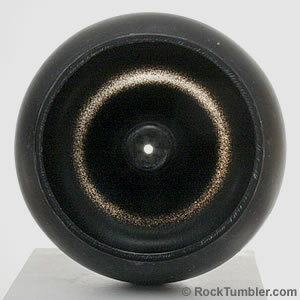 This photo shows a properly filled UV-10 tumbler bowl. Notice the level of material is just below the top of the bowl's center structure. Use a Range of Particle Sizes: Good general practice when running any rock tumbler. Use a range of material sizes to create as many points of contact on the rough as possible. Learn about particle size balancing. A range of particle sizes in a Thumler's UV vibratory tumbler bowl will help the tumbler operate more quiet. It will also reduce bruising on the material and reduce wear on the bowl. If you do not have small pieces of rough you can use ceramic media to achieve a good range of sizes in the bowl. How Full Should the Bowl Be? You should fill UV tumbler bowls to just below the top of the elevated center structure. 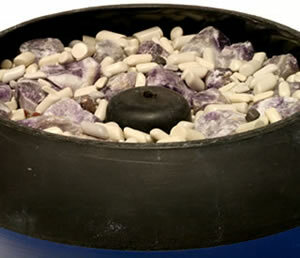 Loading the bowl to this level has a couple of advantages: 1) A full bowl will operate more quiet than a lesser filled bowl; and 2) A full bowl will also help cushion the material, reducing the chance of bruising to the stones. A couple of factors can cause UV-10 or UV-18 tumblers to operate louder than normal. But, if you follow the section above on how to properly load the bowl you greatly reduce these issues. Use a Range of Sizes: Running all large pieces of rough in the bowl is a common cause of excessive noise. The noise comes from large pieces of rough banging against each other and the bowl. Adding media or smaller material to the bowl will reduce the noise level greatly. It fills the empty space between the rough and absorbs impact. Fill the Bowl Properly: The amount of material in the bowl affects how much noise the tumbler makes. A small amount of material in the bowl will cause it to be louder. We have found that loading the bowl to just below the top of the bowl's center structure works great. It reduces the noise by dampening the contact forces between pieces. It also creates a gentler tumbling action. This barrel has been worn away so much that light can be seen through the bottom. If this goes undetected it will cause a mess when it wears through completely while in operation. The black particles floating in the water after rinsing a UV-10 or UV-18 tumbler bowl are pieces of the bowl. There are a few ways to reduce the amount of wear on the bowl. Sharp Angular Rough: Most bowl wear happens in the first step of the tumbling process. The edges of sharp angular rough digs at the bowl much more than rounded material. Use a rotary tumbler and coarse grit for a few days to round the sharp edges before running the stones in a UV tumbler. If you prefer nice rounded stones, run them in a rotary tumbler until you are satisfied with the shape. Not Filling the Bowl Full Enough: In a half full bowl the material can be tossed around aggressively. Material being tossed around will hit the sides of the bowl with more force than material gently tumbling in a full bowl. More force on the bowl equals more wear. How Much Grit and Polish is Needed? Do not use coarse grit in a Thumler's vibratory tumbler! The particle size of coarse grit is too large to adhere to the the rocks and media and it will sink to the bottom of the bowl. Also, like very angular rock, coarse grit will wear the bowl out quickly due to its size, shape and aggressive grinding ability. In step 1, medium grit, we use 6 tablespoons in a UV-10 and 10 tablespoons in a UV-18. We let that run for 48 hours checking the action in the bowl a couple of times a day and adding a little water if needed. At the end of 48 hours we will rinse the material and recharge it with the same 6 or 10 tablespoons, depending on which tumbler we are running, and run it for another 48 hours. Repeat this process as many times as needed to get the stones shaped to your liking. For the second and third steps, fine grit and polish, we use 3 tablespoons in a UV-10 and 5 tablespoons in a UV-18. We run both steps for 2 to 3 days, checking the action a few times a day. The ability to easily open these tumblers while in operation is one of our favorite features. Vibratory tumblers should be checked two or three times a day. Why do you need to check the tumbler? Check the Action in the Bowl: If the action seems slow, add a little water to thin out the slurry and get the action back to normal. If the slurry is too thick and adding water does not get the action back you need to rinse the bowl and material. Then rerun the material in the same grit size. The more you check the tumbler the less chance you have of the slurry getting too thick. Relieve Gas Pressure: Opening the bowl relieves any gas build up that may occur when tumbling. Most material will not produce any gas build up. However, natural and man-made glass will often create gas in the barrel. Gas build up cause problems if the pressure is not released. Check the Progress of the Stones: Checking the material near the end of a step will save you from running the material too long or not long enough. Running too long will wear down the material more than necessary. It will also increase the chance of bruising on the stones. Not running long enough will result in a poor final product. Requiring the material to go through the tumbling process again. Open the bowl, take a few pieces of material out and rinse them off. If these pieces meet your expectations chances are the rest of the material will also. If you think they can improve with more time in the tumbler do a quick rinse of the bowl and material. Then reload the bowl with the same grit size and run it until you are satisfied with the results. Above is a rusty center rod with caked on grit slurry. It's likely moisture has gotten under the foam pad and started rusting the base plate. 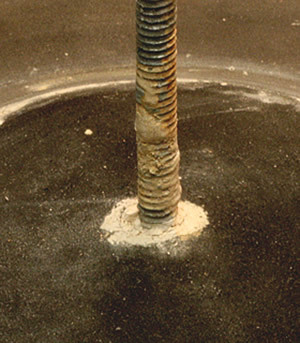 After running our UV-10 for a few months we noticed dried up tumbling slurry and rust on the threaded center post. This rust and build up caused some issues getting the wing nuts down the threaded rod. Oiling the post will protect it from rusting and makes cleaning the tumbling slurry off much easier. Start With a Clean Post: Before oiling make sure the post is clean. If you have never oiled your post before this may take some effort. We used soap, a toothbrush, and rag the first time we cleaned our center post for oiling. Oil the Post: Place a drop of oil above where the lid wing nut and washer sit. Then use one of the wing nuts to work the oil down and around the post. You may need to add more oil part way down the post to cover the post all the way down to the base pad. We oil the center post every time we take the bowl off. The wing nuts and washers are used to hold the bowl and lid in place temporarily not permanently. Once they are snug give them another half turn and stop. The foam pads on the base plate and lid will help the bowl and lid stay snug. If the bowl or lid start to depress or deform when tightening down the wing nut back it off some. The bowl can crack if you over tighten the wing nut and washer. You may also end up stripping the center threaded post by over tightening. Not cleaning the grit slurry off the center post can damage the threads. 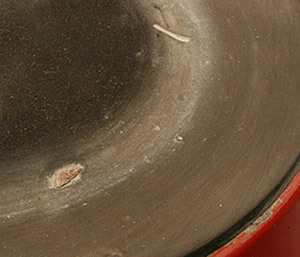 Debris on the base pad can wear a hole in the bowl or the pad if not removed. Keep the Base Pad Clean! 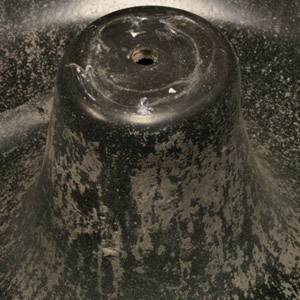 The tumbler's base pad is often overlooked but can cause problems if not checked and kept clean. Not keeping the base pad clean can reduce the tumbler bowl and base plate longevity. A small piece of rough material pressed between the bowl and pad may do one of two things: 1) In a worst case scenario, it wears a hole in the bottom of your bowl due to the constant vibrations when in operation. The end result will be a mess to clean up and the cost of a new bowl; and 2) It will tear the base pad allowing moisture to get under it causing the metal plate to rust. If the base plate rusts to much it will need replaced. The gray stuff you see in this barrel is dried up grit slurry. If this is not completely cleaned off it will contaminate the next step of the tumbling process. Dried up cake slurry on the bowl will give it a gray appearance instead of the normal black color. This dried up slurry will contaminate the next step of the tumbling process if not cleaned. Scrub the Bowl: Getting this caked on slurry off requires some force and an aggressive sponge. Scrub the entire inside of the bowl. After you think it is clean let the bowl dry. If you still see gray on parts of the bowl you will need to scrub it again. Some people use a separate bowl for polishing to reduce the chance of contamination. Clean the Lid Foam Pad: Slurry can and will get on this. If it is not scrubbed clean after every run there is a chance of contaminating your next step. We always scrub the foam and it's edges with a cleaning brush to ensure it is clean. Rinsing UV tumbler bowls and the material in them can be difficult. However, a little dawn dish soap can make it much easier. Add Soap and Water: When a step nears completion, open the bowl, add a couple drops of dawn dish soap and a little water. Let the tumbler run for about 5-10 minutes with the soap and extra water. This will thin out and loosen up the slurry. You will be surprised how much easier it is to get your material cleaned and ready for the next step. Your soap bubble level should be no higher than you seen in this video. This goes hand in hand with the section about protecting your center post. Do not use an excessive amount of soap and water when burnishing. If the soap bubbles get on the center post, capillary action will cause the moisture to work down the post. If the moisture is not cleaned off it will cause the center post to rust. If the moisture works down the shaft and gets under the base pad your base plate may start to rust as well. If tumbler slurry dries on the bowl, lid pad, or threaded rod it will increase the difficulty of cleaning. If slurry dries on your stones you might need to run that step again.